I thought it appropriate on this annual day of Thanksgiving that my mind turned to the attribute God would like to see in all of us- thankfulness. To begin being thankful, we have to think about why we are thankful. Scripture gives us many reasons to be thankful. Here are a few I found and I hope you find that they give you ways to be thankful that you had not thought about. I love God’s Word- it is so complete. Here are King David’s words from 1 Chronicles 16:8-9 “Give thanks to the LORD, call on his name; make known among the nations what he has done. Sing to him, sing praises to him; tell of all his wonderful acts. David reminds us to praise and thank God for all He has done for us. David also writes in Psalm 7:17 “I will give thanks to the LORD because of his righteousness and will sing praise to the name of the LORD Most High”. 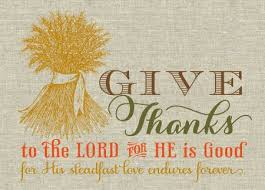 Psalm 100:4-5 “Enter his gates with thanksgiving and his courts with praise; give thanks to him and praise his name. For the LORD is good and his love endures forever; his faithfulness continues through all generations”. We are reminded to be thankful for the very character of God– his faithfulness, righteousness and eternality. Psalm 118:28 “You are my God, and I will give you thanks; you are my God, and I will exalt you.” David is thankful that God is a personal God and desires a relationship with him. Is God personal for you? 1 Thessalonians 3:9 “How can we thank God enough for you in return for all the joy we have in the presence of our God because of you? “ Do you thank God for other believers and the impact they have in your life? God’s eternal kingdom is coming. “Therefore, since we are receiving kingdom that cannot be shaken, let us be thankful, and so worship God acceptably with reverence and awe, for our ‘God is a consuming fire. '” Hebrews 12:28-29 I am so thankful that God’s kingdom is sure, coming and guaranteed by our all powerful, consuming God. Lastly, of the greatest importance to us, 2 Corinthians 9:15 “Thanks be to God for his indescribable gift!” God’s greatest gift to us was Jesus. He sent Jesus to save us from our sin filled state and restore us to relationship with Him!! Considering all these reasons- which speaks to you today? Hopefully, God’s Word reminded you of reasons to be truly thankful today!! Blessings to you as you mediate on God’s Words, give thanks to Him and enjoy the blessedness of friends and family.